LONDON, England (CNN) -- Former British Prime Minister Tony Blair will be called before an inquiry into the country's role in the Iraq war, its chairman said during the opening Thursday. 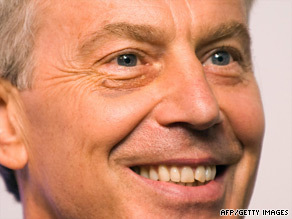 Former British Prime Minister Tony Blair will be called before an inquiry into the Iraq war. John Chilcot told media he would not "offer a list of witnesses" but that "key decision-makers in the key phases of the Iraq affair" would be called. "You can work out for yourself who some of them will be, but apart from the former prime minister [Tony Blair] -- who it's obvious we must see -- I don't want to give a longer list today." Blair's appearance before the inquiry, whenever it happens, will be of huge interest to the British public and media. Blair's office said the former prime minister was willing to assist the inquiry. "As we've said from the outset, Mr. Blair will of course cooperate fully with whatever format Sir John Chilcot sets out for the Inquiry," a spokesman said. Blair's successor, Gordon Brown, announced the inquiry last month, saying it would look in depth at the lead up to and conduct of the war. However, he also said it would not appropriate blame or have any mandate to consider civil or criminal charges. He called the scope of the inquiry "considerable," given that most inquiries of this type would focus on a specific event in a limited period. "We have been asked to examine a range of decisions and actions over a period of eight years," he said. "There are differing views over what happened during that period and why, which we will need to address. We will also, by the way, need to place that whole period of years in a broader historical context." While the committee would not set out to apportion blame or consider issues of civil or criminal liability, it could judge the legality of the conflict, Chilcot said. He promised that committee members had open minds and would review the evidence objectively to reach their conclusions. "We are determined to be thorough, rigorous, fair, and frank," he said. Brown has promised that the committee will have access to the full range of information, including secret documents. "The inquiry can ask for any British document to come before it and any British citizen to appear," Brown said. "No British document and no British witness will be beyond the scope of the inquiry." It's not clear how long it will take the committee to finish its work, Chilcot said. At the end, it will publish a report that will be debated in parliament. After criticism, the government was forced to abandon its original plans to hold the inquiry behind closed doors. Chilcot said the panel intends to make the proceedings "as open as possible, because we recognize that is one of the ways in which the public can have confidence in the integrity and independence of the inquiry process." Some of the hearings may be televised or streamed on the Internet, and the panel will have a Web site on which information will be regularly posted, he said. The start of the inquiry coincides with the withdrawal of the some of the last British troops from Iraq. The agreement that allows British troops to stay in the country expires Friday. The only British troops to remain will be about a dozen helping to train Iraqi police as part of a NATO mission, the defense ministry has said. Chilcot said the panel members plan to visit Iraq as part of their work, as well as hold discussions with Iraqis outside of the country. Top officials from both the British and U.S. governments may also be called upon for evidence, he said. The panel has no power to compel witnesses to testify, but Chilcot said he hopes they can talk to people in the U.S. government. "The Anglo-American relationship is one of the most central parts of this inquiry, and something that we need to get a very strong understanding of," he said.